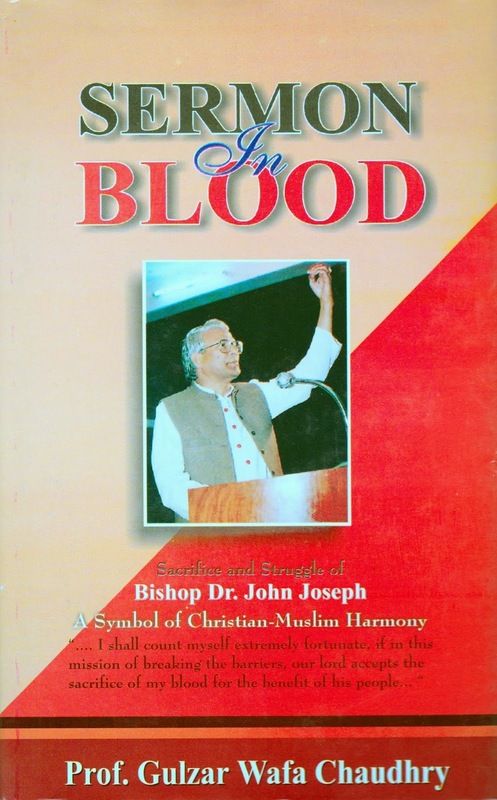 On May 6 1998, at 9:30 pm, Dr John Joseph, the Catholic Bishop of Faisalabad, Pakistan, committed suicide in front of a Court in Faisalabad that had sentenced a Pakistani Christian man (Ayub Masih) for alleged blasphemy. The Bishop's last words, just as he pulled the trigger of the gun held to his own temple, were addressed to him: "Ayub I am offering my life for you". On 5th April 1994 Manzoor Masih of Gujranwala, accused of blasphemy against the Prophet of Islam was gunned down by unknown assassins. During the incident his co-accused Salamat Masih (a minor), Rehmat Masih and a mutual friend John Joseph (of Lahore) also received critical injuries. The funeral for Manzoor Masih was held in the Catholic cathedral of Lawrence Road, Lahore, on 7th April and was attended by people representing all walks of life, and of various faiths and creeds. Bishop John Joseph at the conclusion of the ceremony had stepped forward to the coffin, kissed the feet of dead body of Manzoor Masih and addressing it said, "I wish, I had died in your place." The funeral procession then moved on to the Christian cemetery where he was returned, "dust unto dust". In January 1995 twelve-year old Salmat Masih and his relative Rehmat Masih both co-accused of the late Manzoor Masih were sentenced to death in the session court Lahore. (Death sentence to a minor is against the U.N. conventions to which Pakistan is a signatory). After a dangerous and convoluted legal battle, the accused were acquitted of the charges on 23rd February 1995. The acquitted Salmat Masih and Rehmat Masih were flown to Germany on asylum to save their lives from blood thirsty extremists. On 14th October 1996 Mohammad Akram, a Muslim, registered a case against twenty-five year old Christian, Ayub Masih of Arifwala (District Pakpatan), accusing him of having said to him and his Muslim companions to read Salman Rushdi's Satanic Verses as well as uttering other blasphemous remarks. The real reason was that the Christians, as well as the Muslim residents, were given residential plots by the government and this was an easy and sure-shot way of ensuring that the Christians would vacate their rightful plots so that the Muslim land grab mafia could take their possession. It was the culmination of this case which lead the Bishop to lay down his life, in a manner described in Sermon In Blood. The author details the last ten days of the Bishop, beginning from 27th April when Rana Abdul Ghaffar Khan, Sessions Judge of Sahiwal, awarded death penalty to Ayub Masih under Section 295-C of Pakistan Penal Code. This unjustified verdict caused the Bishop to write a 19 page letter the next day, in which he narrated the events and wrote "I shall count myself extremely fourtunate, if...Our Lord accepts the sacrifice of my blood for the benefit of his people..." (p 13 of the said letter). The letter was faxed to Father Seige at Rome on 29th April. There were ample hints in those last ten days that the Bishop was contemplating self-sacrifice though he never stated it in direct terms. And then when he felt the time was right he asked his chauffer to drive him to the session court where Ayub Masih had been sentenced, and scarified his life in protest, in pursuance of what he earlier had termed "The Final Step against the 295-C". In addition to providing great detail of Ayub Masih's case, the book also catalogues many other atrocities committed against the Christian's of Pakistan. For example, on 5th/6th February 1997 Shantinagar, a Christian village in the Khanewal district, was burned just after 48 hours after Pakistan Muslim League was declared the winner in the elections. In my view the title of this relatively short treatise is as powerful as the saga it has endeavoured to preserve for posterity. Being a powerful orator and an accomplished writer, the Bishop had preached many a sermon from the pulpit. But his very last sermon, which was neither written in ink, nor orated from a pulpit, was heard the world over. When these events were unfolding this reviewer was in Pakistan, and can recall with acute vividness, the shock waves it sent through the nation and especially the Christian community including Catholics and the Protestants. In addition to characterising the bishop, narrating his story, communicating his passion, the book also has a compilation of tributes offered at his tragic death. To counter balance these the athor also enlists the responses from the government and her mouthpieces. The then Information Minister Mushahid Hussain Sayed, stated "The minorities are getting full protectin under law, constitution and under the Islam in Pakistan". Strictly speaking the book is not written in any of the traditional styles of narrating events chronologically, or pursing an argument logically. This is not to say that it is historically inaccurate or that it is illogical, but to stress that it is more of a friend's tribute of sincerity and love, and as it is a work of overwhelming emotions more than of academic discipline, it does tend to be factually repetitious. Regrettably nor is it free from typographical errors. However, coming from a close friend, a fellow Pakistani Christian, and a partner in human rights struggle, it is an excellent resource for sincere students of the plight that the Pakistani Christians find themselves in. Thus, in my view this book must be accepted in its totality in the spirit in which it is written (some might argue that 'compiled' might be a better description of this work).